Ba Zhen Wan (Eight Treasure Decoction) nourishes vital Qi and Blood and is used for palpitations, shortness of breath, weak limbs, dizziness, anemia, heavy menses and abdominal pain. Ba Zhen Wan (Eight Treasure Decoction) – 200 ct. 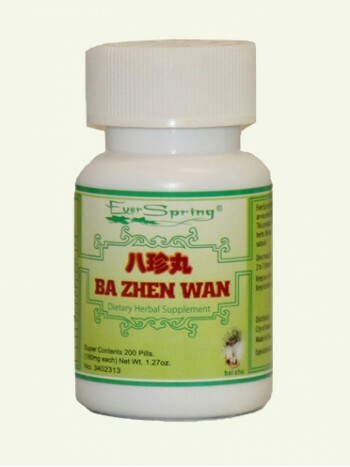 Product Code: Ba Zhen Wan (Eight Treasure Decoction) – 200 ct. This Traditional Chinese herbal formula helps nourish vital qi (energy) and benefits blood. It is used for spontaneous deficiency of both qi and blood marked by pale or sallow complexion, palpitations, shortness of breath, laziness to talk, weakness of limbs, dizziness, loss of appetite, pale tongue with thin and whitish fur, and feeble pulse. This Chinese herbal formula is also used to help anemia due to deficiency of qi and blood, myasthenia of the limbs, heavy menstrual bleeding, and abdominal pain during menstruation. This product is not intended to diagnose, treat, cure or prevent any disease. Traditional preparation procedures are combined with modern pharmaceutical processes to extract the active ingredients from the herbs and to further concentrate them into pills or tablets.